Hurricanes regularly occur in New Orleans. Every three years or so when I was growing up, a storm would be big enough to cause my parents concern. The local news would track it and we watched to see if New Orleans was in its crosshairs. If it looked like it was going to make landfall nearby, we fled by car to another southern city, deeper inland, and waited in a hotel room for the storm to pass. These evacuations were scary, exciting, and deeply unsettling. I still carry the anxiety with me, which becomes acute between June and November, the length of hurricane season. New Orleans is a place that inspires me and is my interior landscape. When I go back to visit my parents, my brothers and sister, nieces and nephews, aunts and uncles, I am not so compelled to make pictures of family, but of place. I make photographs in New Orleans so that it becomes a part of me. The act of photographing makes me feel connected to New Orleans because I can shape and possess an image of it. I often worry the city will disappear before I can return. It has recently been reported that glaciers in Antarctica are releasing sheets of ice that could increase global sea level by more than two feet. Seas that rise will make tropical storms more likely to release damaging floods. All over the world, coastal cities are rethinking their relationship to and redrawing the barriers between land and water. In the United States, global warming is increasing the frequency of hurricanes that reach the Gulf of Mexico and the Atlantic Ocean. My family has been directly affected by these changes. Hurricane Katrina put my parent’s New Orleans home under 10 feet of water. The water stayed for 14 days, destroying the home and the neighborhood where I grew up. This project is an investigation into man-made structures that are designed to protect this fragile place. I am photographing drainage pumping stations, levees, outfall canals, and floodwalls in Orleans, St. Bernard, and Jefferson parishes, built to control water and save the city from submergence. But are these structures equipped to provide safety for New Orleans? Or are they just attempts to slow down what is inevitable, the complete submergence of my home? The title, Laissez Les Bons Temps Rouler, is a Cajun French expression that translates to “Let the good times roll.” To live in New Orleans is to live in denial: denial about climate change, denial about how many calories are in a fried oyster po-boy, denial about the headache after a night spent drinking on Bourbon Street. In a city that can be spontaneously swallowed up in streams of celebration, refusing to acknowledge the threat of submergence is a part of living here. I want my images to be a reminder to viewers that for all its foolishness and fun due to lack of good judgment, New Orleans is facing potentially tragic circumstances. New Orleans is usually lush and colorful, filled with overgrown tropical vegetation for most of the year. However, over the months I was working on this project, the city was in the grips of an unusually severe winter. Freezing temperatures killed much of the vegetation. This left the landscape with a brownish grey palette, a pallor similar to the way the city looked after Hurricane Katrina, when everything was cloaked in a layer of brown mud left by the receding water. These images are void of people, adding to the post-apocalyptic feeling. Except for a house or a graffiti tag, there are few traces of human presence. I want viewers to imagine what the city will feel like once it is no longer inhabitable. This is the New Orleans I remember the month after Hurricane Katrina when civilians were not allowed back into the city. New Orleans’ relationship to water is what caused French explorer Jean-Baptiste Le Moyne to choose this place to found a city in 1718. These first settlers chose the natural levees on the banks of the Mississippi, which were formed by accumulated sediment at the mouth of the river. This marshy land would grow to become a great port city, easily accessible by the Gulf of Mexico and the Mississippi River. Like most aging cities the center began to sprawl but there was only so far to go before the ground turned to marsh. Water had to be removed from the landscape to accommodate the expanding city and to deal with the regular flooding that occurred since its founding. but also handles the city’s potable water supply as well as its raw sewerage. The Sewerage and Water Board recently came under fire because during an August 5, 2017 flood, several pumps were inoperable and neighborhoods flooded. Hurricane Katrina occurred on August 29, 2005. It is not encouraging that just ten years later this system, which is supposed to protect New Orleans, failed again during an unexpected heavy rain, not even a tropical storm. The climate conditions that existed when these pumps were built in the early 20th century no longer exist. Global warming has increased the severity of weather events and likelihood of system strain. Over time, all of the structures put into place to save New Orleans are causing the problems that are making it even more susceptible to water. For a city created and surrounded by water, it is virtually absent from the landscape. 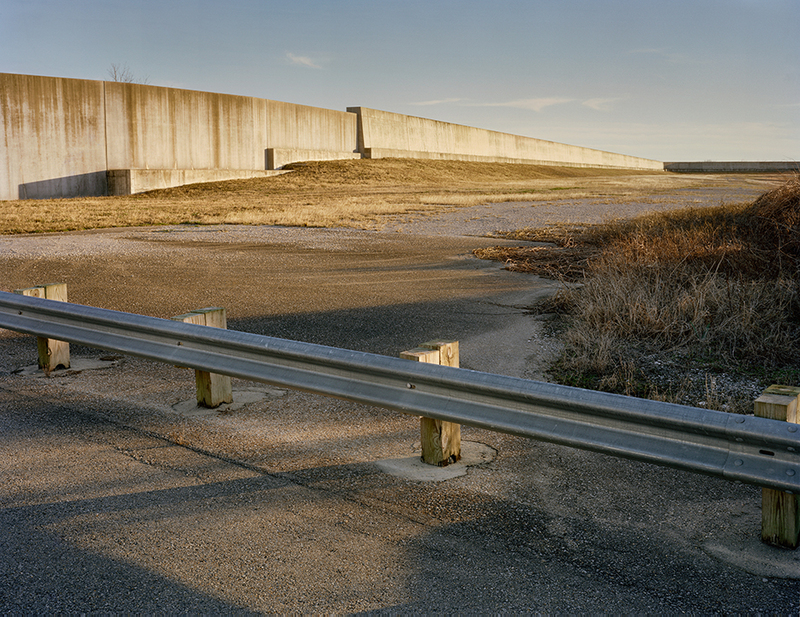 The levees and retaining walls, maintained by the United States Army Corps of Engineers, are preventing water from flowing back into the land and depositing sediment. It is flooding that has kept New Orleans above sea level. Richard Campanella, a geographer with Tulane University, has written extensively on the subject. In a recent article for The Atlantic he states: “What was beginning to happen was anthropogenic soil subsidence—the sinking of the land by human action. When runoff is removed and artificial levees prevent the river from overtopping, the groundwater lowers, the soils dry out, and the organic matter decays. All this creates air pockets in the soil body, into which those sand, silt, and clay particles settle, consolidate—and drop below sea level”. By the time my classmates and I have hung our thesis show, the 2018 hurricane season will have begun. I am aware that in a year, these places I have photographed may be changed or will have disappeared. This gives me a sense of urgency to continue this project, to possess a disappearing place I already miss. Pumping Station No. 14, New Orleans East, 2018. Digital print, 40x50 inches. Levee, Verret, St. Bernard Parish, 2018. Digital Print 40x50 inches. Pumping Station No. 7, City Park, 2018. Digital print, 40x50 inches. 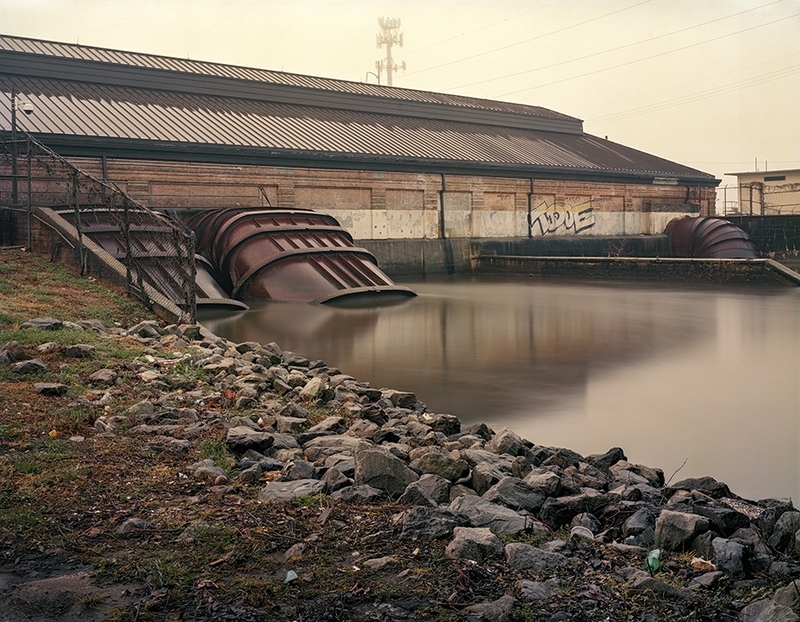 Orleans Avenue Outfall Canal, Lakeview, 2018. Digital print, 40x50 inches.